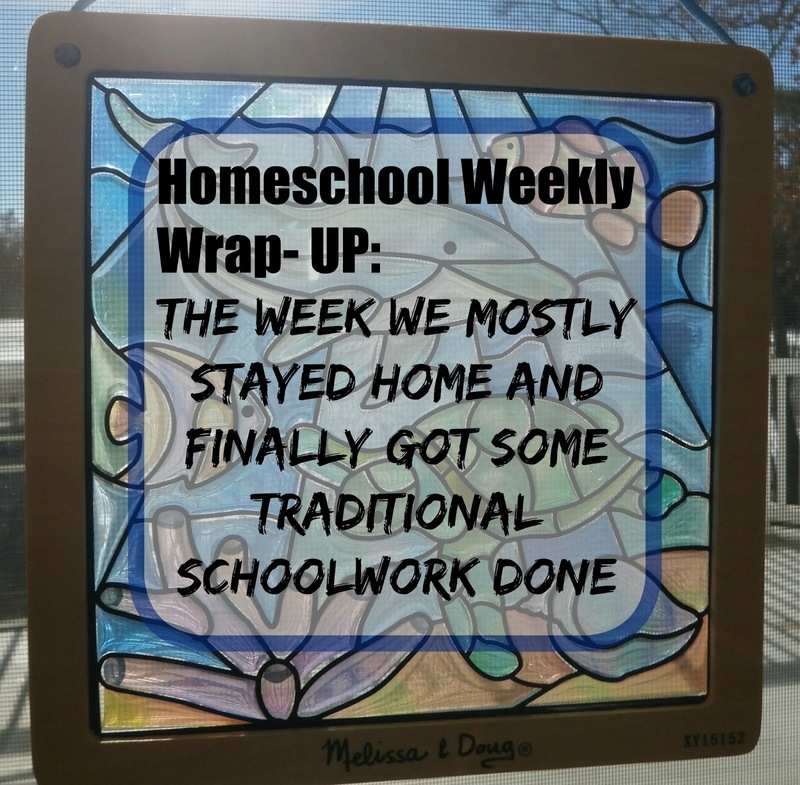 We had a pretty full week of traditional schooling this week. We took one day off to celebrate a birthday and to go visit with some friends but with the cold, bitter temperatures we've been having we were all content to stay home in our pajamas. It was a fun week and I enjoyed watching my boys playing together all week long. Reading-- Ian read I Drive A Street Sweeper, Canoe Days, 20 Big Truck In the Middle of The Street and started reading a new series called Treasure Hunters. I know he loves this set since I've found him reading in his room at least three times this week! Alec read Diary of A Wimpy Kid, part of Diary Of a Wimpy Kid Roderick Rules, part of Zeus and the Thunderbolt of Doom, his new Pokemon guidebook Black 2 White 2, and read Dino Swimming out loud to Evan one night while they had a sleepover. Evan read Itchy Itchy Chicken Pox, Puppy Mudge Loves his Blanket, Splat the Cat The Rain is a Pain, Puppy Mudge Has a Snack, Drop it, Rocket! and Dino Swimming. We read another few chapters in Hero's Guide to Being an Outlaw and started listening to The Magician's Nephew. Sight Words/ Emergent Reading-- Evan and I played a few games working with digraph blends. He had fun popping the sight words one day; getting some more active practice in as he decided to try karate kicks, hits, and jumping. He also had a cut and paste activity matching the words to the digraph blend sounds at the beginning of each picture. Writing and Language Arts-- We read I Wanna Iguana and all the boys had to write about their favorite pet; they told me what their favorite pet was and four reasons why they would want that animal as a pet (or why the pet they already have is their favorite). It was fun and funny-- Ian wanted a fish because he wouldn't have to walk it, they're cheap and easy to replace, the tank would be easier to clean than a lizard tank, and there are a lot of fish to choose from. Evan wants a hermit crab because he could keep them in his room, pick out new and pretty shells, they're cute, and he could clean the tank by himself. Alec loves our cat because he's adorable, he lets us know when he wants to go outside or needs more food, he's nice and lets Alec pet him. The older boys worked on the next pages in both of their Thinking Tree spelling workbooks while Evan completed two more pages in his Star Wars Reading book. The boys spent a morning writing in their journals. We had a roll and write activity (found here). They rolled the dice and that determined who their main character was. Then they rolled again to determine the setting of their story and the final role determined the problem of he story. They then settled down to write. I was pleasantly surprised when Evan wrote three whole sentences spelling just about every sight word on his own! The boys enjoyed this activity and asked if I had any other roll and wrote worksheets to choose from. So I went searching and found this one, this one, and this one. We finished our writing this week with a fun art/ writing combined activity. They wrote the words I couldn't imagine life without... in the middle of a large sheet of paper and wrote all the things they could not imagine life without. They then colored each word and we had a pretty display for our walls. Evan was even able to participate but asked if I'd help write and color half of the words. Math-- All three boys worked in their math workbooks each day completing two pages each time. Evan had a dot to dot page counting by 3's; preparing him for the threes times tables. The older boys worked on the second set of pages in the Thinking Tree Math Genius book. Ian played Qwirkle with his dad one night while Alec and I played his new game Labyrinth. We LOVED it! It was fun and challenging and so fun to find a new game. Evan added up his remaining Christmas money to see how much he had left and to figure out if he could buy the new Lego set he wanted. Ian added up his money and filled out his bank deposit slip. Coloring in his Thinking Tree Spelling Pages after finishing Are You a Math Genius? Geography-- We read Everybody Bonjours!, The Cat Who Walked Across France, E is for Eiffel Tower, and This Is Paris! We're starting a unit on France and the French Revolution (at Alec's request). History-- We started reading You Wouldn't Want to be an Aristocrat in the French Revolution and talking about what life was like during the French Revolution. Science-- We all watched the documentary Snow Monkeys learning more about the Japanese Macaque. Alec put together his new Glow in the Dark Terrarium he got for his birthday. Ian finally pulled out his Makey Makey that he had gotten for Christmas and all the boys spent a fun afternoon turning play- dough into a piano and bongos. Ian also played around with using the Makey Makey to play video games on-line on a few of his favorite websites. We made crystal paper following the instructions in our kitchen science book. (You can read about it here). 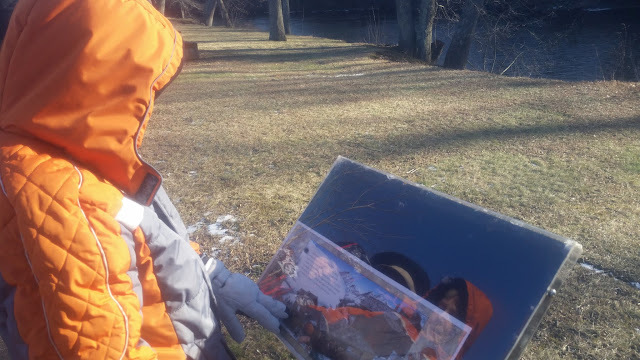 We bundled up and went on a walk one afternoon along the river; taking note of the changes in season and reading the story that was posted along the trail. We read Jan Brett's Gingerbread baby. Art- Alec worked on his Stained Glass Made Easy kit that he had gotten for his birthday. When he finished it up we had a beautiful display for our window! Socialization-- We spent the holiday Monday visiting with some friends of ours who go to public school. They don't live near us and we hadn't visited with them in quite some time so we headed out nice and early and spent ALL day visiting. It was so fun and the boys were thrilled to have the day off from school. We had several parties to attend this past weekend and had fun with our friends. Physical Education-- We had a few birthday parties over the long weekend. So we spent the weekend jumping around, running through laser mazes, climbing rock walls, and playing air hockey. We got a bit of snow this week and the boys went to shovel the walk and play in it for a bit until the temperatures dropped and the winds came. They had a fun morning at karate sparring each other and their classmates. Life Skills-- Alec learned how to make a dirt cake this week; helping me put together his cake. He also took care of his fish tank, cleaning the tank and changing the water. All three boys helped dust, sweep and vacuum the house. Alec has been offering to try all sorts of new foods too; now that we have a weekly food menu the boys aren't complaining about our meals nearly as much knowing that they're guaranteed to have some of their favorite foods at some point. It was one of those weeks that just flew by and I was pleasantly surprised when the only thing the boys complained about was our housework. They got along well, enjoyed our schoolwork, and it was nice enjoying some more quiet time at home focusing on creating a good routine for us all. Love the sight word idea. What a great way to use those air baggy things! I'm so glad you all liked our sight word popping idea; We've used it for letters, math facts (multiplication mostly)... and just about anything else I could think of! Such a fun, quick and easy lesson and they're all always begging to pop them when we get stuff in the mail so it's a great incentive too. Oh, what a great idea! Pop words! When my youngest was, well, younger he would have loved this being a sensory kiddo! The stained glass is beautiful! Thank you! He just got another kit last night and can't wait to dig in. I love how the stained glass turned out. A simple craft with a very nice outcome. Also a good choice with the dirt cake. It has been a while since I last made one, but they sure are delicious! It was; my nephew actually asked if I could make a dirt cake for his birthday too. The kids loved it.